KAUKAUNA — The Wisconsin Ravens semi-pro football team’s 2017 home opener at Kaukauna High School is set for 3 p.m. Saturday, May 13, 2017 against the U.P. Arctic Blast. The game is one of three to be played in Kaukauna this season at Bank of Kaukauna Stadium. The Ravens also host the B.C. Blackhawks May 20, 2017 and the N.L. Cowboys July 8, 2017 in Northern Lights Football League play. 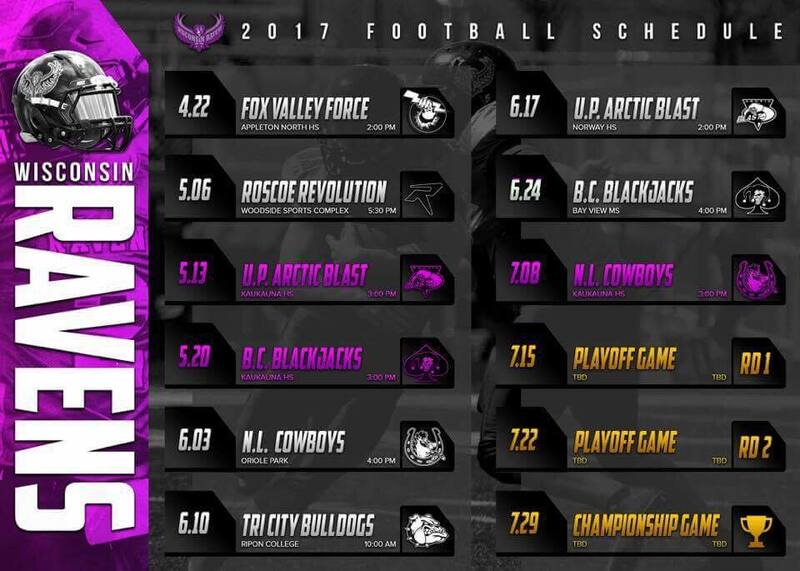 The Ravens opened the regular season May 6, 2017 with a 26-8 victory over the Roscoe Revolution. The Wisconsin Ravens are the defending Northern Lights League Champions. Tickets are $8 for adults and are available at the gate.